I spend a wonderful afternoon with Renne & Andrew for their wedding at Lothian Chambers. It was pouring with rain in the morning but by the time I headed to Canonmills to pick them up for our little jaunt around the Old Town at 1pm it was a glorious winter’s day. We headed for Arthur’s Seat first for some nice photographs around the loch up there then headed to the Salisbury Crags view point for some spectacular Edinburgh backdrop shots. I think we were all grateful to get back into the warmth of the car as it is freezing now! Renee and Andrew didn’t mind though so off to the High Street we went for some more photographs before meeting up with family and friends at Lothian Chambers for the ceremony. 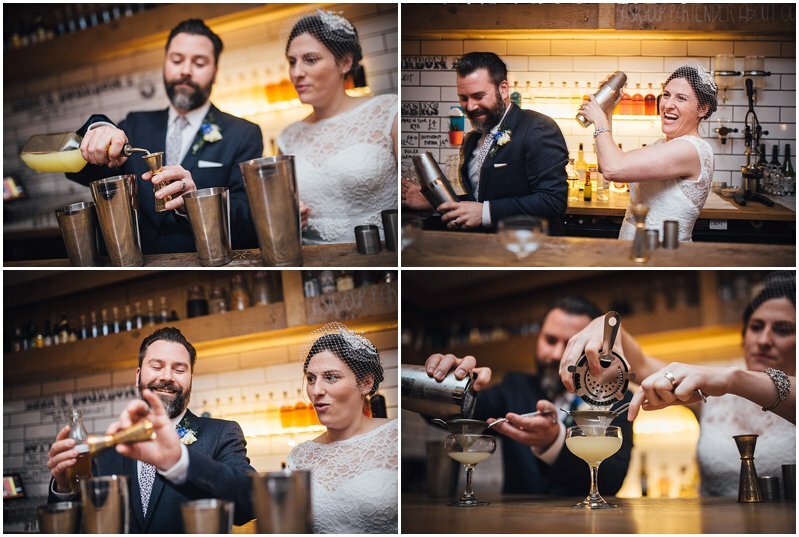 The newlyweds finished their day at Lucky Liquor, a brilliant little bar on Queen Street where the mixologist had created a cocktail just for them which they made together with their guests looking on. 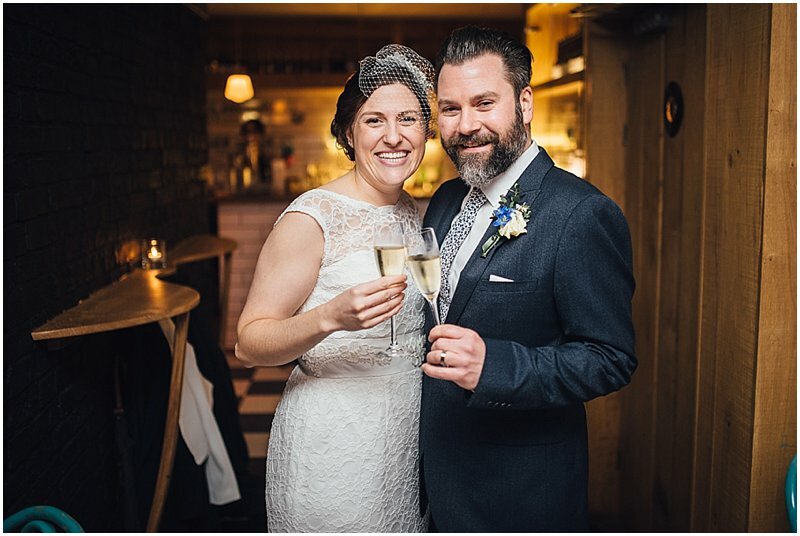 I love small intimate and fun weddings and this was one of the very best! The Balmoral Hotel is the most iconic building in Edinburgh and a very popular venue for weddings. 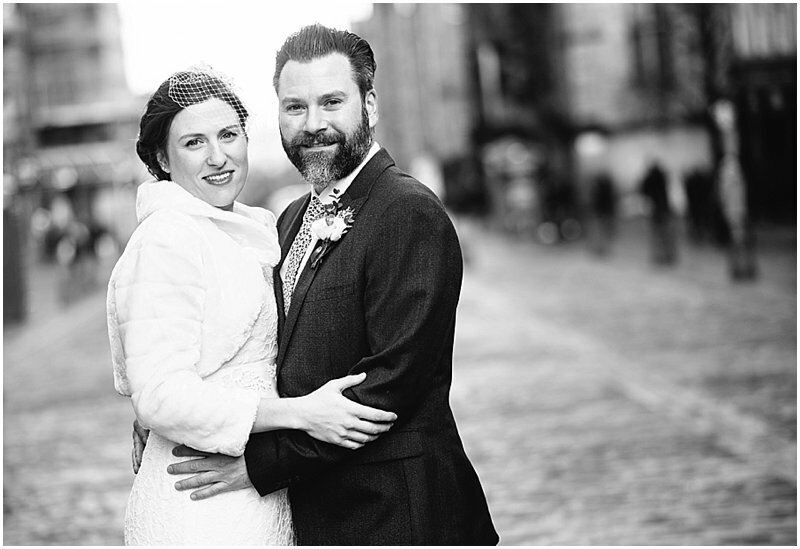 Carys and Craig were actually tying the knot at Lothian Chambers over on George IV Bridge before heading back to the Balmoral for the wedding breakfast and the reception. 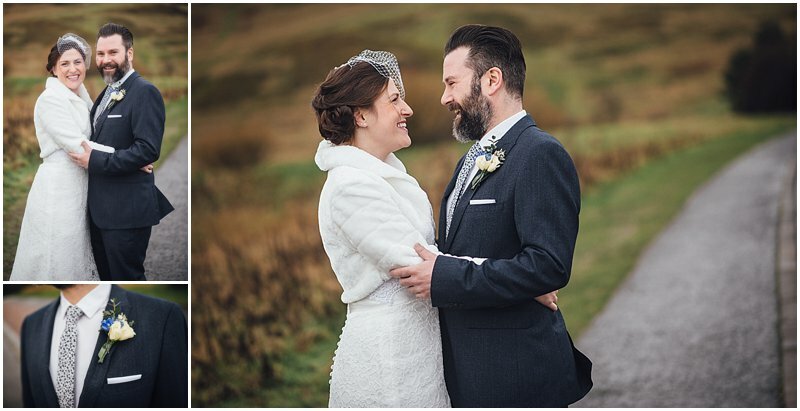 We started at The Balmoral for the bridal prep shots where Freda Howden had just started Carys' make-up. Family were coming and going, the weather was great, not just for December up here but just in general. The sun was shining...I was going to be a perfect day. Then it was off the Lothian Chambers in the heart of Edinburgh's Old Town for the wedding ceremony. It's a stunning building with ornate marble pillars and beautiful wood features. The guests gathered in anticipation for Cary's arrival as Craig shared a joke with Andy at the top of the room. Carys looked just stunning as her and her father walked down the aisle. After the ceremony it was outside for the group shots which we had pre-arranged so we could get through them nice and quickly. It was getting a little colder now so I didn't want the guests hanging around too much. Once the family shots were done we wandered the High Street to get some nice portraits of Carys and Craig before heading back to The Balmoral where we were greeted by Toastmaster Bob and The Balmoral's fantastic (Award Winning) wedding planner Elizabeth Lorimer. 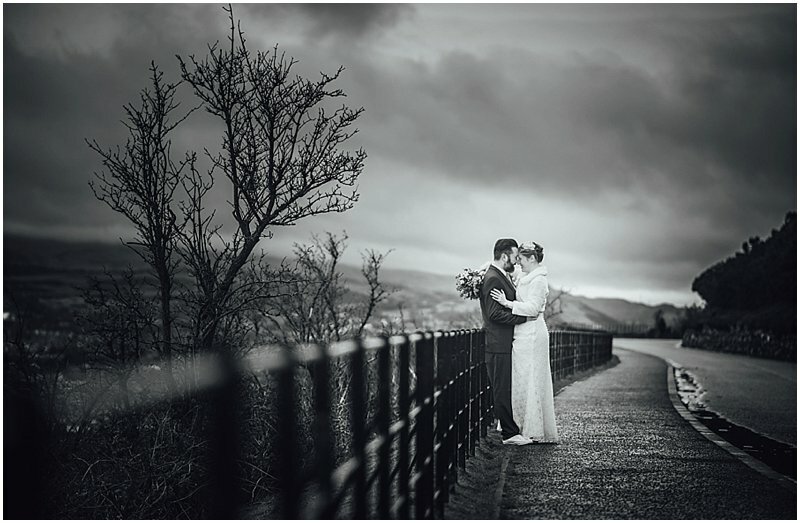 As always the staff at The Balmoral were wonderful and we were offered the chance to head up to the roof of the building for a few more shots of Carys & Craig. Toastmaster Bob led the way to the roof and kept us entertained in the chilling wind up there. 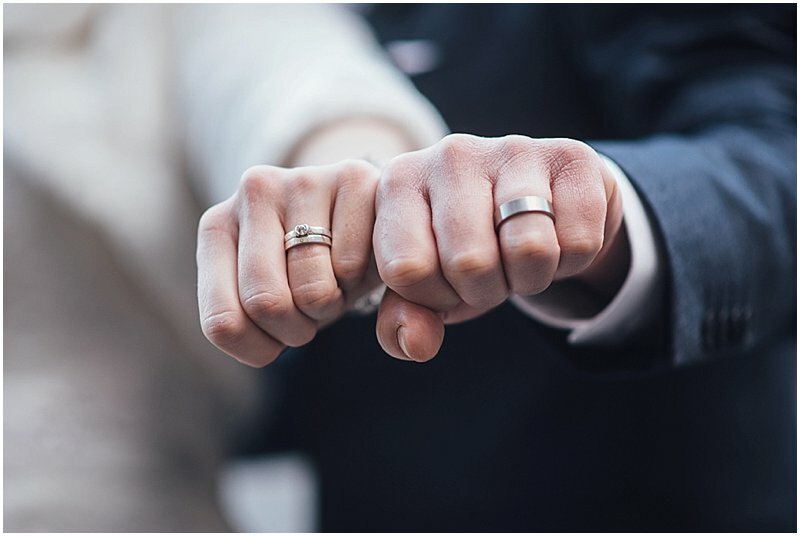 Toastmaster Bob was fantastic and a highly recommended addition to any wedding to add a little bit of gravitas and fun to your special day. After dinner we had the speeches followed by the dancing in to the night. What a fantastic day and it really doesn't get any better! Loved every minute!